In 1841, a boy was born in a small French town who was destined to become a genius creator. Years later, having moved to Paris, Pierre Renoir became one of the most sought-after masters of his time. Renoir was a bright representative of impressionism, an excellent schedule and a talented sculptor. The greatest fame brought him portraits, which Pierre painted for the Parisian nobility. In 1888 his next painting “Daughters of Catullus Mendez at the piano” came out from under the brush of the master of painting. It depicted a fashionable plot of that era – a combination of young ladies and a musical instrument. 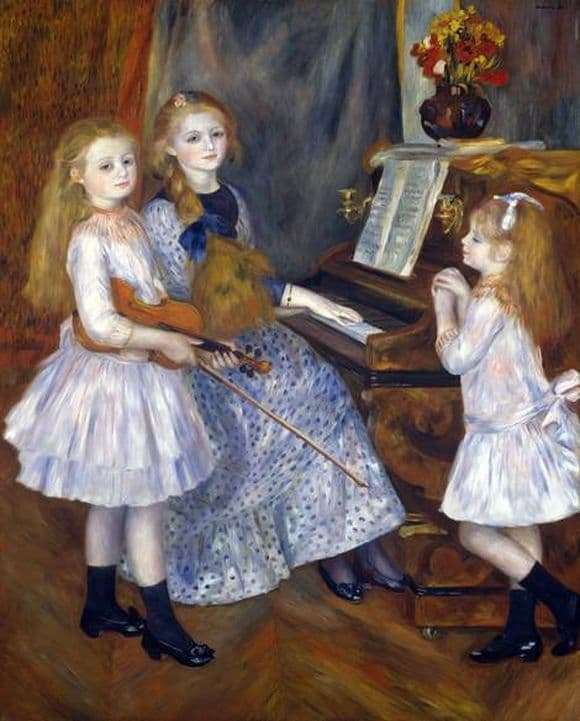 Many artists embody a popular theme on canvas, Renoir was no exception. In the center of the plot are three girls sisters. One stands with a violin in his hands, the other hand gently touch the keys. Their gaze is directed directly at the viewer. The third, the youngest, waits for the sisters to begin their improvised concert. Girls are dressed in the latest fashion. They have beautiful silk dresses and shoes. Composition complements the piano and a bouquet in a vase. The composition surprisingly harmoniously combines many colors and textures. The canvas was written from life. Three little heroines of the plot – the stepdaughter of the famous French poet Catullus Mendez. The painting was created on the eve of the Paris exhibition. The work bears the imprint of tenderness, femininity and lightness of young beauties. Their looks are soft, warm. The images turned out extremely realistic and alive, despite the characteristic manner of the artist.